1. The 40-story Chase Tower in downtown Phoenix recently was purchased by 201 North Central Avenue Property LLC, a joint venture between Wentworth Property Co. and Taconic Capital Advisors LP. An affiliate of that entity took title to the Chase building with a $78.8M bid at an April 13 trustee sale. The bid included a 1,900-space parking garage across the street from the tower. 2. HFF has announced a $63.5M refinancing for The Scottsdale Plaza Resort, a 404-room, full-service, independently owned and operated resort hotel in Scottsdale. HFF worked on behalf of the borrower, Scottsdale Plaza Resort, LLC, to place the loan with Apollo Commercial Real Estate Finance Inc. Loan proceeds will be used to refinance a maturing CMBS loan. The resort recently completed a multi-million-dollar three-year renovation. 3. The new 11-story, 210-key Hampton Inn & Suites by Hilton is now open in downtown Phoenix, Mortenson announced. Mortenson also announced it has sold the new property located at North 1st Street and East Polk Street to Apple Hospitality REIT. The hotel will be managed by North Central Group, a leading hotel management company. The reported sales price was $44M. 4. Institutional Property Advisors, a division of Marcus & Millichap, announced the sale of Vue Park West, a 260-unit multifamily asset located within Park West, a 250KSF open-air lifestyle center in Peoria. The property sold for $43.55M. IPA’s Steve Gebing and Cliff David represented the seller, a joint venture between Baron Properties and Buchanan Street Partners, and procured the buyer, an institutional investment manager. 5. A partnership of American Healthcare Investors and Griffin Capital Company LLC – the co-sponsors of Griffin-American Healthcare REIT IV Inc. – has acquired Surprise Medical Office Building, a Class A facility that is part of a 756-acre master-planned community in the Northwest Valley of Phoenix, for $11.7M. JDS Real Estate Services Inc. Broker Diana Shirek represented the seller, Banyan Surprise Plaza LLC, while Griffin-American Healthcare REIT IV financed the acquisition under its revolving line of credit with Bank of America and KeyBank National Association. 6. Troy Giammarco and Tyler Smith of NAI Horizon negotiated the sale of a 30KSF property, representing the seller, C.R.C. Investments, LLC, for $6.3M. The property is located at 8445 E. Hartford Drive, Scottsdale. Steve Barger with CRE Property Advisors represented the buyer, Proverbs 3:5, LLC. 7. Marcus & Millichap announced the sale of Chase Bank, a 4,214SF net-leased property in Goodyear. The asset sold for $4.95M. Jamie and Mark Ruble, investment specialists in Marcus & Millichap’s Phoenix office, had the exclusive listing to market the property on behalf of the seller, a limited liability company. 8. ORION Investment Real Estate recently sold the 66-unit short-stay motel, formerly known as, Best Inn Suites, located on Van Buren Street and 36th Street for $3.3M. The buyer’s plans to convert the motel to apartments are already underway. Zack Mishkin of ORION represented the buyer in this transaction, Risi Companies, LLC. Joseph Dietz and Bob Farrell of ORION represented the seller, Rudra Investment LLC. 9. Brennan Investment Group, LLC, a private real estate investment firm that acquires, develops, and operates industrial facilities, announced its purchase, and simultaneous leaseback to F&B Manufacturing of a two-building, 80KSF facility at 4245 N. 40th Avenue in Phoenix. No price was given. 10. 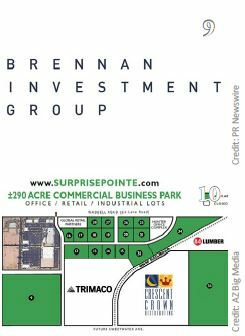 ESI Ventures announced the sale of 179 acres of a 290-acre mixed-use business park called Surprise Pointe in Surprise. Patrick J. Feeney, Jr., with CB Richard Ellis, is representing ESI in the sale. No sales price was given. 11. Chris Gerow, Shelby Tworek, Gabe Ortega and Patrick Anthon of NAI Horizon represented the landlord, VTA, LTD, in a 36-month retail lease for 36.8KSF at 3003 W. Apache Trail, Apache Junction. Carl Cunningham with My Home Group Real Estate represented the tenant, Sunshine Acres Boutique & Donation Center, Inc.